Last week, the federal government finally dismissed 11 controversial counts from its overzealous prosecution of journalist Barrett Brown. These counts charged Brown with identity theft for sharing a link to records documenting improper and potentially illegal activities by the U.S. intelligence contractor, Stratfor Global Intelligence. The fact that Brown has been in jail for 18 months, based in large part on these charges, has threatened and continues to threaten press freedom in the United States. Just two days before the government dropped its charges, Brown's lawyers filed a motion to dismiss these specific charges. We were planning to file an amicus brief in support of Brown a few days later on behalf of EFF and some of the most influential organizations protecting the rights of journalists around the world, including Reporters Committee for Freedom of the Press, Reporters Without Borders, Freedom of the Press Foundation, and PEN American Center. We called the Assistant U.S. Attorney handling the case on Tuesday to let her know we planned to file the brief (a formality). The next day, without any warning to us or to Brown’s lawyer, the government filed its motion to dismiss, which the court granted on Friday. But as we argued in the brief, the government should never have brought these charges in the first place. The government charged Brown with trafficking in stolen authentication features and aggravated identity theft for sharing a link to records that included millions of emails discussing opportunities for rendition and assassination and detailing attempts to subvert journalists, political groups and even foreign leaders. They also included tens of thousands of credit card numbers and their verification codes. The records were published online after hackers broke into Stratfor’s servers. While the government alleged Brown transferred the link from one IRC channel to another, it never alleged he transferred the actual files or the credit card numbers or was in any way responsible for the Stratfor hack. Brown faced a minimum of two years in prison on each charge, and a real risk of 20 years if the court decided to run each two year sentencence consecutive. Long-settled Supreme Court precedent establishes that the publication of truthful, lawfully obtained information about a matter of public concern is protected by the First Amendment. It doesn’t matter if the journalist knew someone else illegally obtained the information as long as she, herself, obtained it legally. As we argued in our brief, Brown’s actions clearly merited First Amendment protection. Brown, who was a prolific writer for a number of publications, including Vanity Fair, The Guardian and Huffington Post, appears to have shared the link to the Stratfor files with a team of other journalists to crowdsource the review of the voluminous records. Earlier in 2011, Brown relied on crowdsourcing to review and report on 70,000 emails from HBGary, another government contractor, after Anonymous hacked into its servers. By sharing the link and crowdsourcing review of these documents, Brown only did what thousands of other journalists do every day. For journalists, “linking” is crucial to effectively providing readers with background and context to stories. While this may seem like an obvious point, it apparently was not to the government. Crowdsourcing has become quite common for both independent journalists and traditional media outlets too. It allows news organizations to work with others—including outside journalists, select groups of volunteers, or even the general public—to review huge troves of records. One need only look to the Snowden NSA releases to see how important linking—even to illegally-obtained records— and crowdsourcing has been for journalism and citizens around the world. It all started on June 5, 2013, when The Guardian reported on and linked to a top-secret order issued by the Foreign Intelligence Surveillance Court (FISC) ordering Verizon to disclose telephone metadata of all of its customers. That order is still available online. As other organizations, including the New York Times, the Washington Post and CNN, reported on this breaking news, they too linked, not only to the Guardian’s article, but to the order itself on the Guardian’s site. And as more revelations about the NSA programs emerged, these media organizations linked to other top-secret orders and classified intelligence materials and shared the links with the public through social media like Facebook and Twitter. Crowdsourced review has also been crucial in the NSA reporting, given the quantity of the documents and the technical information contained in them. Journalists have teamed up across newsrooms and with security researchers to better report on the material, ensuring its broader impact on society. As stories continued to break, the public retweeted and shared these links with friends, coworkers and family members. By sharing these links, these media organizations—and any members of the public who shared the NSA records with each other—were also disseminating classified and top-secret national security information—information protected by statute (the Espionage Act) no less than the credit card records at issue in Brown’s case. But the government has yet to bring charges against anyone who shared the NSA information (except Snowden himself). In fact, a recent CRS report found that publication of national security information is likely protected under the First Amendment. It is possible the government came to its senses and dropped these charges after realizing the First Amendment problems with its prosecution. Its initial determination to prosecute Brown may have been motivated by the government's claim that Brown allegedly threatened an FBI agent and his children in a video posted to YouTube. (This happened after the FBI threatened to charge Brown’s mother with obstruction of justice for failing to produce Brown’s laptop.) Brown still faces charges for this alleged threat in a separate criminal case, as well as charges of obstruction of justice for allegedly concealing evidence. However, these separate claims do not excuse the government for bringing specious identity theft charges against him for the simple act of sharing a link. Ultimately, the government’s prosecution of Mr. Brown continues to threaten not only journalists and the press, but the public at large. We rely on the media to report on government and corporate impropriety—even when that reporting requires a journalist to review and share illegally obtained records. However, if journalists fear they could be charged with a crime for newsgathering and reporting (even if the charges are later dropped), they may think twice about whether the publication is really worth the risk. This case threatens the public in another way. Just like journalists, we all regularly share links with friends and family through email and social media platforms like Facebook and Twitter. These links may be to news and human-interest stories, medical research, gossip about movie stars, or shopping deals, but these communications are all threatened by the government’s broad application of the criminal statutes at issue in Brown’s case. You can read our full amicus brief here. * Some minor changes were made on March 20, 2014 to the original version of this blog post. 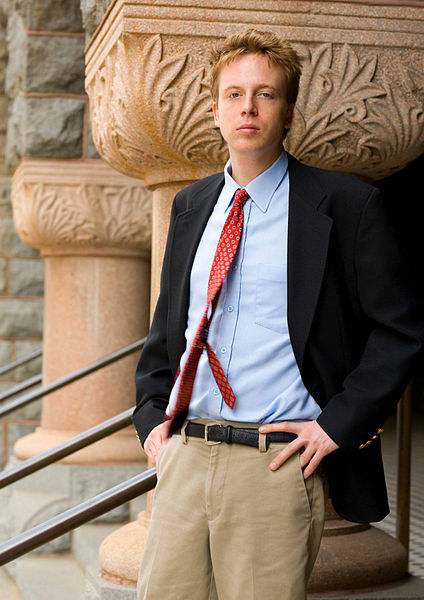 Image: Barrett Brown by Free Barrett Brown, released under Creative Commons Attribution-Share Alike 3.0.